The novel opens in the middle of an inferno in the mountains east of Los Angeles. 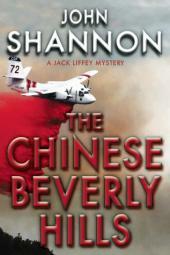 Private Investigator Jack Liffey is contacted by his former mistress, Tien Joubert; her niece, Sabine Roh, is missing from her home in Monterey Park, and Tien wants to hire Jack Liffey to find her. He reluctantly agrees, though he is wary of the seductive Tien’s motives and the effect the job might have on his strained relationship with Gloria, a police officer suffering from the effects of a crippling attack. In the course of his investigation, Jack Liffey attends a fundraiser for the Tea Party that turns out to have been organized by a radical anti-immigrant gang. Jack learns that Sabine had been part of a group of teenage revolutionaries fighting the racist gang. At the keg party, chaos erupts, causing Zook, the leader of the gang, to go into hiding in his cabin near the fire zone. After the party, L.A.F.D. arson investigator Walter Roski informs Jack that Sabine’s remains were found in the ashes of the wildfire. Jack questions Zook at his cabin, then travels to San Diego to question another suspect from the fundraiser: the border-guarding militiaman Hardi. Hardi reveals Sabine’s drug-smuggling activities but denies killing her. Jack helps a reporter who has been drugged and held captive by Hardi. At the same time, the gang’s muscle, Captain Beef, kidnaps one of Sabine’s fellow revolutionaries and brings her to Zook’s cabin. While the mystery unfolds, Jack Liffey’s daughter Maeve begins a relationship with a woman who is a member of a strange cult. Gloria’s efforts to repair her relationship with Jack are stymied when he renews his affair with Tien. The book’s climax features a dirty cop working for the gang, as well as Roski, Zook, and Captain Beef and his hostage all converging on the cabin. Jack, who has suffered a heart attack, is missing. The cabin is swept up in a landslide caused by the fire. Roski interrogates Captain Beef, who confesses to Sabine’s murder and to starting the fire, before leaving him to die in the landslide. The book ends with Jack in the hospital reconciling with Gloria.